What are We Worth? A. Something B. Nothing C. Bunches D. None of the Above | Lord...What's My Motivation? Officially, this is my first on-location blog! I’m literally standing in the Student Center cafeteria at Faith Lutheran right before lunch, listening to the scribblings and growling stomachs of the 9th grade future leaders, as they complete their PSAT test. I watch these sharp as tacks….bright as bulbs….self-proclaimed (in some cases) under-achievers as they hurl themselves at these standardized booklets and fill-in-the-dot sheets….and I wonder if they are really “here.” You know what I mean. Either you’ve “dealt with” or “been” one of those students who checks out the second the room falls silent. The occasional volleyball player takes a a glance up…so that she can concentrate on how to find the area of the triangle. The lack-luster wrestler shifts so that he can get a better look at Suzie, who is sitting two rows over. It’s hilarious. People-watching…that’s what I’m here for folks! 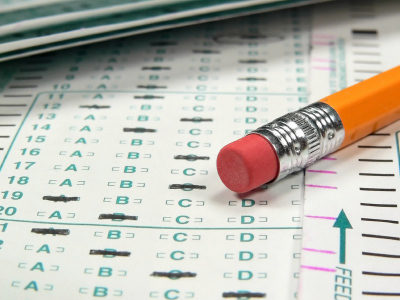 But, really…is standardized testing the answer? Are the definitive conclusions to WHAT WE KNOW going to be discovered through structured involvement in a testing process that forces students out of the classroom for an entire day and into a 30 page booklet? My argument is this: We assume that dead silence in a “controlled” environment is the key to ideal performance conditions. How ludicrous. Football players need to “pump up” before a game. Boxers need sound advice from their coaches and taped-up wrists prior to a fight. Ballet dancers need a bunch of stretch time. What to test-takers get? A nice, hard lunch table….dead silence….and a 10-minute break to enjoy their stale muffin. And we huff over an our ranking in the percentile. Sheesh. I teach performance-based classes. I’m a drama teacher for crying out loud. Why can’t we measure the breadth of a students knowledge based on performance? Not an easy thing to propose, yes, I know. But, isn’t that part of the problem? Do we all too often take into consideration HOW we do things instead of WHY we do things? I think a YEAR-LONG observation of what a student DOES with what they’ve learned, would be a good standardized test. Talk about a crazy task….but that would certainly be getting to the root of testing what students know…am I right? Being able to regurgitate information is not enough. Who cares WHAT you throw up….but do you know WHY you threw up?! These poor, poor students. God love ’em. With their pairs of #2 pencils….their graphic calculators. (One is pink and bejeweled. Props to Hillary.) I wonder what will happen to these students. I wonder if they’ll grow up to be nuclear physicists, or oceanographers, or lion tamers, or hippies….or whatever! No one knows. There is a wealth of personality, creativity, freedom, and LIFE in this room right now. They don’t know it yet, but these freshman….they’ll be someone, someday. First choice of college…second choice? Who knows…but I guarantee the vast majority aren’t thinking about that when they’re trying to meet the 6-8 sentence quota for the short answer section of the English essay. Some are done already. They’re looking at me. Hmmm. They shouldn’t be done so soon. Funny. From the looks on their faces, they know that. They know they could have concentrated harder. ….And yet. I don’t know that I don’t blame them. Can paper and pencil and a morning of filling in tiny dots be what determine one’s worth? Arguable. This entry was posted on October 15, 2008 at 12:33 pm and is filed under THE HIGH SCHOOL THEATRE CLASSROOM with tags Faith Lutheran, freshman, number 2 pencils, restults, standardized testing, Students, test, testing, worth. You can follow any responses to this entry through the RSS 2.0 feed. You can leave a response, or trackback from your own site.